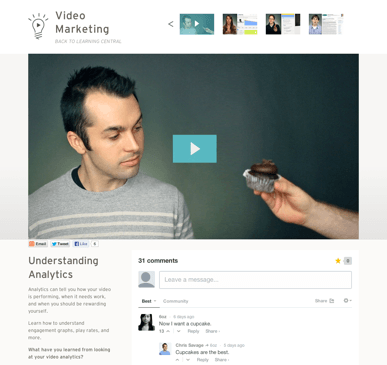 Business Video Analytics – Wistia on Engagement | Rewatchable, Inc.
Great article over at Wistia on the role engagement can play in using business video analytics to tweak your content and improve your video marketing results. In short, Wistia is a business-focused streaming video hosting service that offers an engagement graph that allows you to see exactly who’s watching your video, for how long, whether they skip around, and what (if any) parts of your video are being re-watched. See points with low engagement? Tweak ’em until you get solid engagement from beginning to end. In Wistia’s case, they use surprising moments (like handing your speaker a cupcake, or having their CTO bust out into a freestyle rap) to maintain engagement — but Wistia is a young, cool, edgy company, and so it’s funny and charming when they’re doing these things. But what if you’re not a hip, young, edgy company? No one wants to see Eric Schmidt with a cupcake. Or Steve Ballmer rapping. Do you even need to create videos with high across the-board engagement? At Rewatchable, through a lot of trial and error, we’ve developed a two-stage approach to engagement. If we’re producing a targeted video with a known audience, we’ll do exactly what Wistia suggests and tweak the heck out of the video in any way possible to keep viewer engagement up right up through the call to action. But if we’re producing a broader marketing video that may be on the long side for some portion of our customers’ desired audience (and with broader-topic videos, your videos will be too long for some viewers), we’ll usually try to front load the video with an exceptionally strong/dense/catchy 30-60 second payload. That payload should focus on the information that you absolutely, positively want your audience to have, even if they leave early. Our Wistia engagement graphs may show a gradual tail-off for those videos, but as long as that tail-off occurs after that initial payload of content, we’re okay with that and will focus the rest of the video on the audience the longer-form content is geared towards. Are you measuring your viewer engagement? Let us know how, and what kind of results and changes you’ve seen by using it in the comments section below! If not, you should definitely check out Wistia. They’ve got a world-class analytics package and packages suitable for everyone from the tiniest business just starting out in online video right up to large-scale enterprise campaigns.